Opened in February 2019, Denzy Gelato is a relatively new addition to the slew of cafes serving ice cream and waffles. Be that as it may, this humble cafe nestled under an HDB is worth a visit not just for its affordability but also their range of flavours. 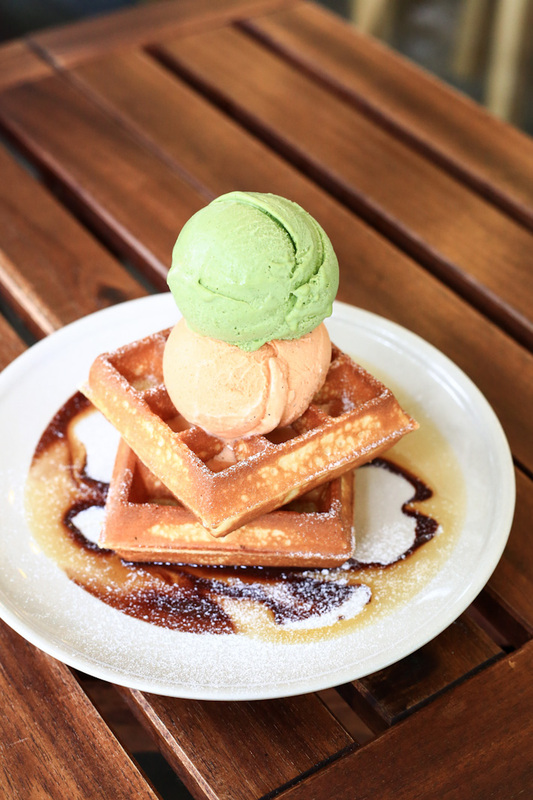 A waffle with ice cream set will set you back by just S$8—try out their premium flavours (+S$1) including Elderflower Mojito Sorbet and Persian Peach, in which the latter is made using saffron and almond. Located in Tampines 1, HyfeCafe is a travel-lifestyle concept cafe by Changi Recommends and also the first of its kind in Singapore. Be sure to make some space for their waffles and ice cream after having their hearty mains. For S$8.90, you get 2 golden-brown waffles, a scoop of ice cream, some berries and a sprinkle of icing sugar to give your dessert an added sweetness. Crispy on the outside and fluffy on the inside, this dessert left quite an impression on us and we reckon you try it too! 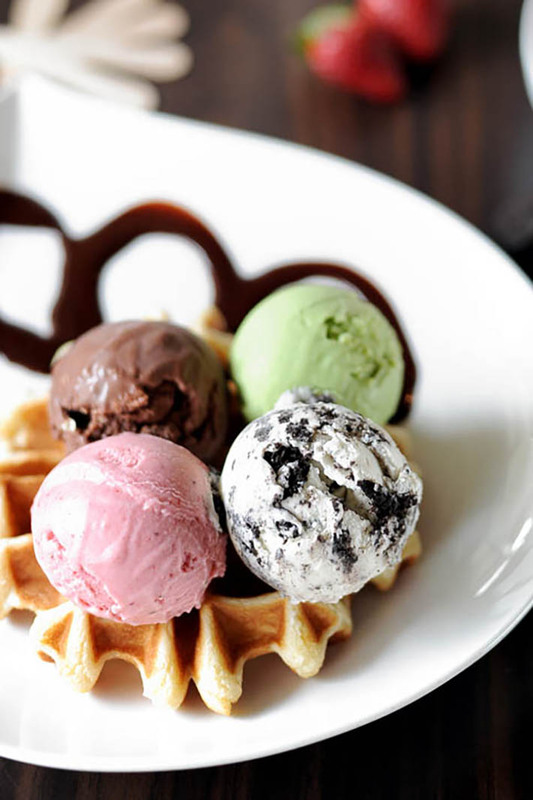 A cafe that needs no further introduction, Hatter Street serves one of the best renditions of waffles with ice cream in Singapore. 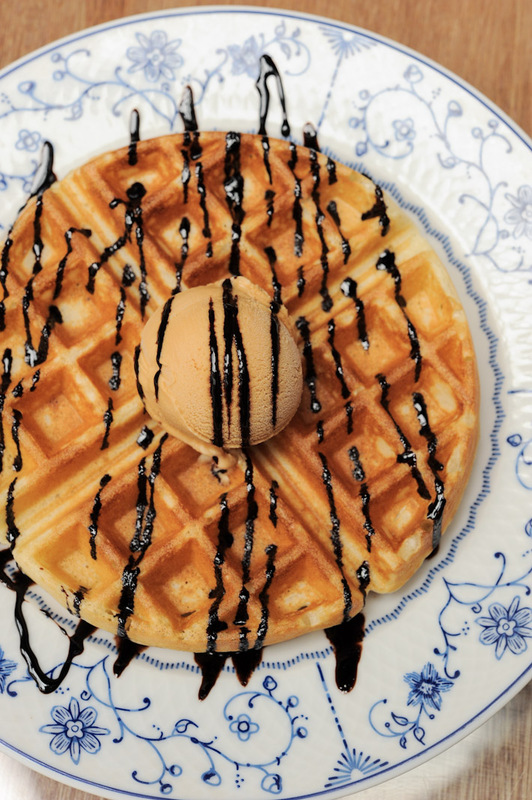 Their Whoaffles (S$9.50) comes with a single scoop of ice cream and sauce of your choice. Thick, superbly crispy yet maintaining a light and fluffy interior, their waffles have earned them a pool of regular patrons so if you’re a fan of the waffles and ice cream combination, be sure to try them out. Serving a plethora of savoury mains and sweet bites at affordable prices is Wimbly Lu, a gem of a cafe tucked away in Serangoon. A whole waffle and a scoop of ice cream and sauce of your choice costs just S$8.50. If you’re looking for smaller portions, head over to Little Wimbly Lu, which serves half portions of the same desserts at even cheaper prices! It might be slightly out of the way to get to Wimbly Lu, but we promise it will all be worth it. Easties should be no stranger to FATCAT Ice Cream Bar, a household name when it comes to desserts in the East. Pair their Original Brown Butter Waffles (S$5) with a scoop of ice cream (S$3.90, S$4.50 for premium) to beat the heat of our sunny island. If you’re feeling adventurous, make no mistake and order up a serving of Charcoal Waffles (S$6) instead and top it off with a drizzle of Salted Egg Yolk Sauce (S$1)—the ballsy, colourful combination that FATCAT Ice Cream Bar became popular for. Creamier has always been at the forefront of the waffles + ice cream scene and for good reason. They spare no effort in making sure that every handcrafted ice cream and coffee is made to utmost perfection. You’ve likely seen stacks of the waffles and ice cream all over Instagram—a testament to their popularity amongst students and adults alike. For S$9, you get 2 thick waffles and a scoop of ice cream of your choice. One of the most popular ice cream parlours in Singapore to get an ice-cold treat, Udders definitely doesn’t disappoint if you’re looking for a spot to grab dessert. 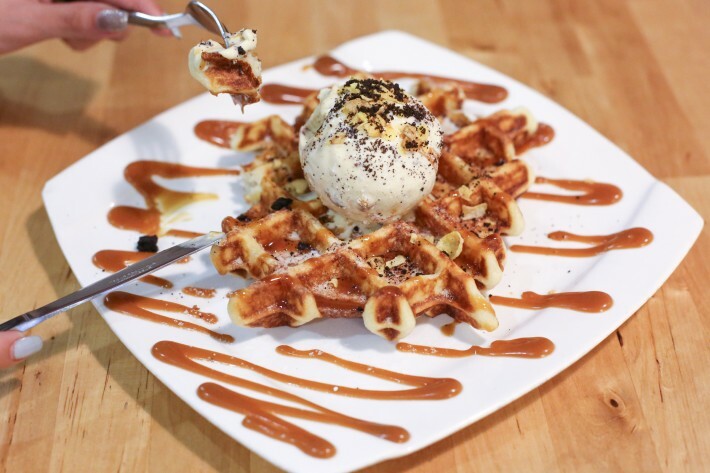 Udders is best known for its ice cream (S$4) but we highly recommend that you pair them with a serving of waffles (S$4). Started off as a 24-hour laundromat, Laundry Galley is the first laundry-themed cafe in Singapore and they serve desserts on top of providing laundromat services. 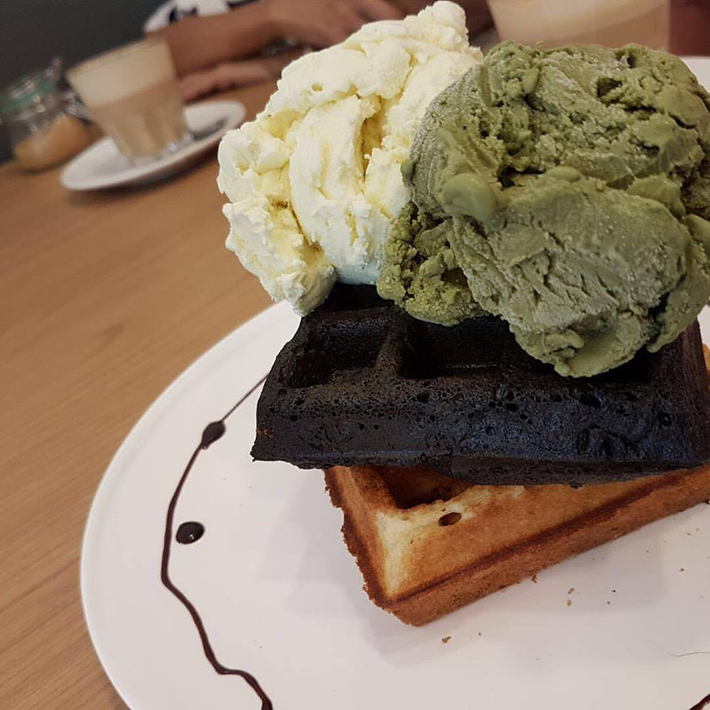 The combination of an original waffle and a charcoal waffle costs S$5 while a single scoop of ice cream will set you back by S$4. What’s more, the cafe is Halal-certified so our Muslim friends can come enjoy their treats too! 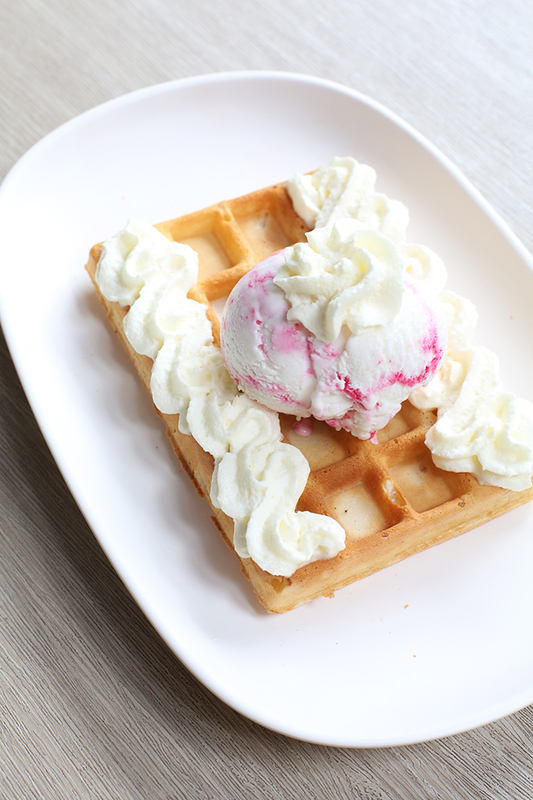 Order up a signature Belgium waffles topped with ice cream (S$4.20). Their desserts are quite possibly the most basic rendition of ice cream and waffles—and likely the cheapest—in Singapore. Routesixtysix is a small yet cosy cafe and it is situated just across the street from FATCAT Ice Cream Bar. Their Buttermilk waffles with a scoop of ice cream (S$9.90) is one of the fluffiest you’ll ever come across—we kid you not. Their charcoal waffles and red velvet waffles are definitely worth a shot too. If you want the ultimate bang for your buck, order up more ice cream scoops atop your waffles for sharing as it is more worth the price!